I was hoping someone from here would be able to help me restore my data or/and partition structure. - Warning: the current number of heads per cylinder is 122 but the correct value may be 255. About the following partition can't be recovered. There should only be one Linux (ext4) partition but testdisk shows two partitions. Probably because I accidentally try to analyze boot sector and did a mistake due to my ignorance and not ask first and act later hope I didn't mess things even more because of this mistake. I would me most grateful if someone takes 2minutes of her/his life and explains to me what is going on and how can I restore my second partition. 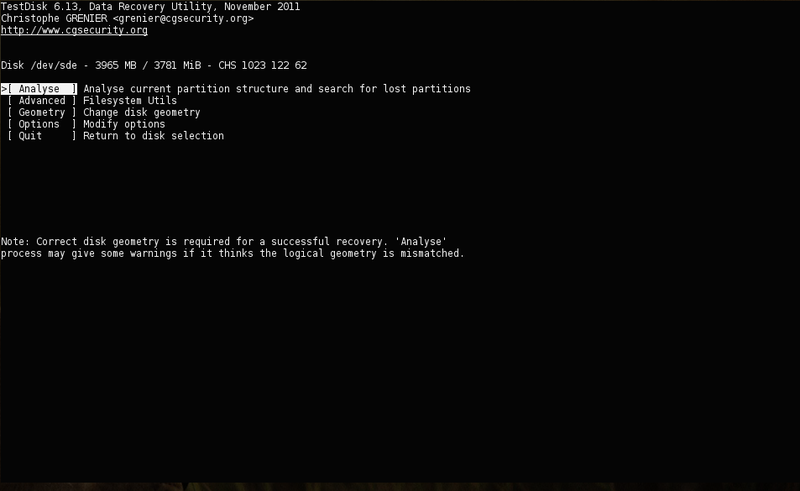 Note that first partition (fat) is working and I can mount it normally. Again I'd be much appricieted if someone who is more knowladgable in this area could help me out. Warning: the current number of heads per cylinder is 122 but the correct value may be 255. So please, I ask someone, anyowne who is experienced with TestDisk and data recovery to help me save my data. I will be much grateful. If someone would at least give me an explanation of what is going on including my mistake I made with testdisk would help a lot. Still struggling to rescue my data but so far no rescued data. Would it be possible to repeat your diagnose and partition table type none? Currently it looks like your partition starts not at the beginning of the card and ends after disk limit. Before we use any trick like increasing the amount of cylinder to have a try to access the data of your partition, I'd like to see the results of partition table type None. You'll find the partition table types after you confirmed with enter at your disk/card selection. To provide the complete diagnose, you can copy and paste the contetnt of the testdisk.log. Fiona, thank you so much for your reply! Hope the log and/or screen shots help you help me. Your current ext4-partition is still in your partition table. To have a try to run fsck successful, you can use testdisk to determine a backup of your superblock and run fsck again. For ext4-partitions is the same procedure. Otherwise you'd need dataraecovery software which reads underlying data in sectors, like PhotoRec. If I understand this correctly my superblock size s_blocksize=4096 is 4096 and is located at block numbers_blocks_per_group=32768 32768? 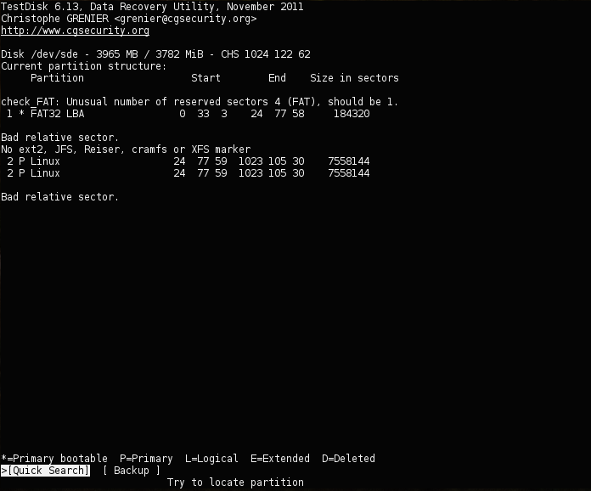 Note that after quick search there is ext4 partition present. Is there anything else I can do to get as much data back as I can with testdisk or is that it? Thank you for your help so far Fiona, I really appreciate it.